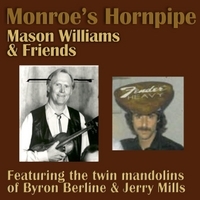 Twin mandolin version of Bill Monroe's classic hornpipe played by Byron Berline & Jerry Mills, backed by Mason Williams & friends. On a Bluegrass cake, twin fiddles or twin mandolins is the ultimate icing. Byron Berline & Jerry Mills serve up a tasty duet on this one. Monroes Hornpipe was recorded by Bill Monroe in 1958 and while it had been part of Monroe's set list for quite a while, it did not appear on any of his recordings until "Bluegrass Instrumentals" in 1965.